Evergreen Pest Management provides a reliable safe effective Pest Control Service. We have been servicing the Tweed, Byron, Gold Coast regions since 2000, treating thousands of properties including homes, schools, hospitals, offices, shopping centres and other businesses. Evergreen Pest Control can eradicate all Pest problems efficiently using the latest environmentally friendly pest control processes. We service all areas from the Gold Coast to Northern NSW including Burleigh Heads, Palm Beach, Elanora, Currumbin, Tullebudgera, Tugun, Bilinga, Kirra, Coolangatta, Tweed Heads, Banora Point, Terranora, Bilambil, Chinderah, Fingal Heads, Kingscliff, Cudgen, Salt, Pepper, Reef, Casuarina Beach, Duranbah, Tumbulgum, Condong, Eviron, Murwillumbah, Mooball, Burringbar, Uki, Bray Park, Clothiers Creek, Cabarita Beach / Bogangar, Hasting Point, Pottsville Beach, North & South Golden Beach, New Brighton, Ocean Shores, Brunswick Heads, Billinudgel, Mullumbimby, Byron Bay, Suffolk Park, Bangalow. General pests treatments, cockroaches, ants, fleas, spiders, bedbugs, mosquitos, midges, rodents etc. Allow 1-1.5 hours depending on the size of the property. 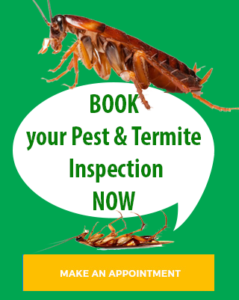 Termite inspections, usually 1 to 2 hours onsite (depending on the size of the property), the official comprehensive report is prepared with photos, detailed explanations recommendations and site diagrams in the office and emailed to the client. Stuart is available to discuss the termite report with the client and provide any advice about termites found, termite prevention and any water leaks or areas of high moisture which could attract termites. It is best to sweep/vacuum or mop and vacuuming beforehand. You can sweep and vacuum any time after the treatment but best to avoid mopping for a week to give the treatment better effect. Pesticides/Insecticides used have low mammalian toxicity and will generally have no odour. During the Pest Control Service, it is fine be at home though if you are pregnant, have severe asthma or have babies/toddlers as a precaution it is best to vacate the area for 4 to 5 hours. All sprays and dusts used are of very low toxicity though discuss any issues with the technician and gel baits can be used alternatively if necessary. Treatment is tailored to the extent of the infestation and type of pest. Note; we use the lowest mammalian toxicity of insecticides available however we recommend that pet water bowls be emptied and refilled after. All fish tanks and bird cages should be covered. Please feel free to call or ask our technician 0409849452 any questions. The Environmental Protection Agency has more closely monitored the Pest Control Industry since 2001 banning the use of the most dangerous pesticides such as Organophosphates which are highly effective and long lasting eradicators of pests though they are also highly toxic to humans and the entire ecosystem. Evergreen Pest Management has never used this type of toxic chemical. The use of safer less toxic chemicals requires more skill by the technician who chooses the most effective chemical for the type of pest (this is often a pyrethroid based substance meaning that the active ingredients have been produced to mimic the effect of the daisy plant chemical, Pyrethrum), then rotating the variety of chemicals used as the pest builds up resistance to it and applying the substance exactly where the pest inhabits or tracks. The active ingredient in modern low toxicity general pest management is in a concentration lower than 1% however it is enough to eradicate small insects without odour or effect on mammals. It is up to the skill of our technician to apply the chemicals safely in precise amounts and in the right areas to avoid contact with your family, your pets and you. The pest sprays are applied with minimum droplet size at low ground areas, thus eliminating airborne residues.